Sotheby’s has unveiled the full offerings of our New York auction of American Art on 13 November 2017. Led by two masterworks by Norman Rockwell, sold to benefit the Berkshire Museum in Pittsfield, Massachusetts, the sale of 84 works of art represents the diversity of the American Art category, including strong examples of illustration, impressionist, modern and western art spanning the 19 th and 20 th centuries . The New York exhibition will be open to the public for 10 days, beginning 3 November. Shuffleton’s Barbershop © SEPS licensed by Curtis Licensing, Indianapolis, IN. All rights reserved. Saying Grace, which holds the current auction record for the artist set at Sotheby’s in 2013 – the work is a visual testament to the full extent of Rockwell’s artistic abilities and incomparable imagination. Rockwell’s ambitious composition positions the viewer as the witness to the action taking place beyond the cracked plate -glass window of the storefront. His dramatic treatment of light – the golde n light that bathes the trio of musicians contrasts vividly with the shadows that blanket the rest of the closed- up shop – immediately captivates. Further engaging is the variety of naturalistic details Rockwell includes to emphasize the authenticity and immediacy of the scene. When considered together, however, these minute elements – a World War II remembrance poster; a December 1949 issue of Walt Disney Comics and Stories ; a fishing rod a nd creel; the scroll of a cello – adopt a much more potent meaning. 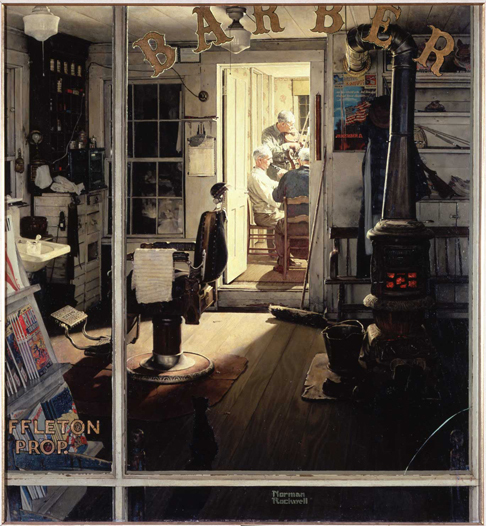 At its core, Shuffleton’s Barbershop is the culmination of Rockwell’s investigation into the power of observation and the process of making art. Thus as he presents a subtle and unexpected marriage of high and popular culture, Rockwell asserts the idea that art can be found in the most unexpected of places or inde ed, that an illustrator can be a true artist. Also selling to benefit from the Berkshire Museum is Blacksmith’s Boy – Heel and Toe (Shaftsbury Blacksmith Shop) by Norman Rockwell ( above , estimate $7/10 million). Monumental in size – measuring 70 1/4 inches across – the painting was commissioned for a story that appeared in a 1940 edition of The Saturday Evening Post about a horseshoe-forging contest, which included the following lines: “I’ll never forget that last hour. And never, I imagine, will any of those who watched. Both men were lost to everything now but the swing from the forge to the anvil, the heels to be turned and the toes to be welded.” The excitement of the narrative, articulated from the point of view of the local blacksmith’s son, is brilliantly portrayed by the two men who captivate the growing crowd with this demonstration of their strength and skill . Working from a series of photographs, which he exactingly orchestrated down to the last detail, Rockwell depicts a total of 23 figures in the composition , including a self - portrait and two different representation s of one of his favorite models, Harvey McKee, the undersheriff of the town of Arlington, Vermont. Half the artworks consigned by the Berkshire Museum in a Nov. 13 Sotheby's sale have been withdrawn, reports Berkshire Eagle. Seven works remain in the sale, including two Norman Rockwell paintings that the artist's family has filed a lawsuit to oppose the museum's deaccessioning of the works. Removed from the Nov. 13 auction: Albert Bierstadt, "Giant Redwood Trees of California"; Ralph Albert Blakelock, "Rocky Mountains"; Frederick Edwin Church, "Valley of Santa Isabel, New Granada"; George Inness, "Mountain Landscape — The Painter at Work"; Thomas Moran, "The Last Arrow"; Charles Wilson Peale, "Portrait of General David Forman"; and Rembrandt Peale, "George Washington." Berkshire Museum, in Pittsfield, Mass., announced in July that it would sell 40 artworks from its collections to generate about $50 million, to help fund a New Vision plan to refocus the museum on science and history. Sales at Sotheby's are set to start in November and extend to March 2018. The artworks removed from the Nov. 13 sale could appear at a later date. This season’s offerings of American modernism are led by Milton Avery’s Sunset Sea. Executed in 1960, and having been owned by only one private collector , Sunset Sea embodies the innovative consideration of color for which the artist is acclaimed today (estimate $2/3 million). The seascape, inspired by the landscape of Provincetown, Massachusetts, where Avery spent several summers, strikes a balance between pre-war realism and post-war abstraction; fields of shimmering , subtly modulated color stretch across the canvas, drawing comparisons with the works by renowned contemporary Color Field artists including Mark Rothko and Adolph Gottlieb. The November sale features two works by Georgia O’Keeffe, an icon of American modernism Shell and Blue and White Abstraction evoke her lifelong fascination with the natural world. The first, painted in 1937, exemplifies the artist’s mastery of form and color (,estimate $700/1,000,000). Her keen understanding of tones of white and her thoughtful experimentation with orientation shine through in this stunning depiction of a subject that attracted her attention from a young age. The second, Blue and White Abstraction, searches the expansive New Mexico sky and captures a bird in flight (estimate $500/700,000). O’Keeffe reduces the subject to its most essential lines and shapes, compelling the viewer to consider the abstract qualities inherently present in the natural world. An American who lived in France for most of his career, Frederick Carl Frieseke’s work often featured his favorite model: his wife Sadie. In Gray Day on the River, painted by 1908, she and her companion float serenely on a boat, surrounded by the verdant landscape of Giverny (estimate $1.5/2.5 million). Exhibited across the United States, including Massachusetts, Tennessee, Georgia and Florida, this striking example of American Impressionism will be included in the forthcoming catalogue raisonné being completed by the artist’s grandson, Nicholas Kilmer. Albert Bierstadt’s Indians Crossing the Columbia River brings the American West of the 19 th century to life this November (estimate $1.5/2. 5 million). Belonging to a distinguished American collection for over 40 years since its acquisition in the 1970s, the work offers a romanticized vision of the Oregon landscape ; Mount Hood, the imposing peak in the background, majestically rises above the radiant Columbia River where a group of Indians row across the water towards shore. Embodying tranquility and serenity, the sublime landscape attests to the national desire for renewal and peace following the Civil War. Rest and Two Men Scything epitomizes Winslow Homer’s quiet depictions of rural life, demonstrating the personal connection he felt with the pastoral countryside and its inhabitants (estimate $150/250,000). The two renderings explore the beauty of the American landscape and the inno cence of youth—themes that appear frequently in Homer’s work. In the post -Civil War period, the scyther became an especially poignant motif that sought to evoke hope for rebirth and a desire to return to the country’s agrarian roots.